Of course non of us need horses but we all have them and how could I resist these beautifully coloured filly foals? Having always admired the breed I never thought I would get round to owning one, then it occured to me that I was getting no younger so if I didn't do it soon I never would. What makes them even more special are the colour genes they are carrying. 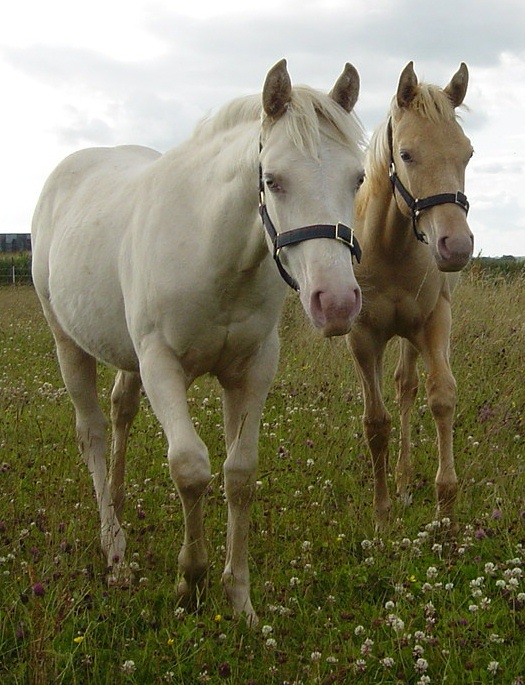 Both seem to have the champagne colour which their father has and I suspect Icicle has a cream gene too from her palomino mother and Fizz has a dorsal stripe so probably has inherited the dun factor from her grulla mum. If I ever breed from them we could get some very unusual colours but initially they are here to look beautiful, have a happy foalhood and eventually be riding horses, oh, and to adorn my fields with their gorgeous colours. Fizz is a wonderful, sandy colour and gleams like pale gold. She looks palomino but is actually pale, gold champagne. Her silvery mane is tipped with dark gold as if it has been dipped in paint and looks so different. 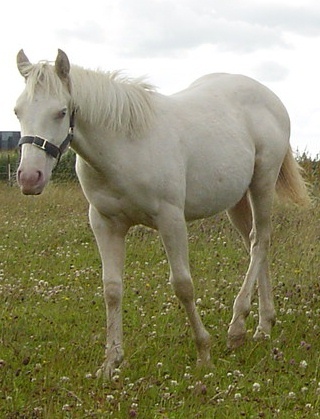 Icicle could be described as cremello until one notices the eyes are a greeny colour and will probably turn amber or hazel eventually and her legs are a very very light gold and looks like she will be a very pale gold when she looses all her foal fluff. Probably she is what used to be called ivory champagne but nowadays would be called gold champagne with cream but don't quote me on that, I am very new to this colour! I am awaiting test results but like to think of her as palomino with champagne. Thanks to Shandy of Kernow Animals in Cornwall and to Paul for fetching them here in such perfect condition. If anyone out there would like one like this get in touch and I will give you their breeder's contact details (she has others looking for good homes). They have exquisite temperaments. The dna test results are back, this is the e mail i received and it is as I suspected, whoopee! carrying single inherited copy and will pass to 50% of foals when bred. champagne dilution gene, and will pass the trait to 50% of foals when bred. genotype of this horse is ee + Aa + nCr + nCh. her a Gold Ivory Champagne. See how they are growing in the pictures below, they are now very happy to come to me in the largest of fields and seem very settled, i trimmed their feet last week and they very rapidly get anything new.